[mrgreen] Lost Island is a video slot machine game that conjures up ideas about thick trees surrounded by a lot of water and the need to beat someone else to the treasure. The game itself may not live up to all of these ideas, but in reality it is a slot machine game that is designed expressly for the purpose of allowing people to win bets and it does manage to accomplish this on a regular basis. While it is definitely not the most graphically stunning video slot machine game that has ever been produced, it is a game that people can have fun with if they have a few extra minutes and they want to see if they can win a few dollars. The basics of the game are a lot like the basics and most other games of this type. However, there are a few subtle differences. 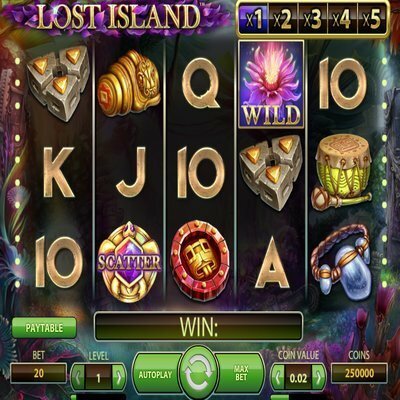 As is the case with many other video slot machine games, Lost Island incorporates 20 separate play lines and five reels. This particular game has a flower for a wild symbol and gold jewelry as its scatter symbol. It offers the ability to play anywhere between one and 10 coins for each play line, which makes it a little bit different than some of the other games that only allow one coin per play line. In addition, this game incorporates a minimum of 10 free spins. This is great for individuals that are playing for the first time. Another good thing about the free spin section is that the wild symbol basically shows up in the middle of the reel and stays there the entire time, thereby increasing the chances that you might win something. One of the major complaints that some people have had about Lost Island is that major payouts do not occur that frequently. In truth, major payouts do not occur that frequently in many video slot machine games, and when all things are considered, the payouts are not really that bad when compared to the amount of money that is typically spent on a bet. In addition, smaller payouts occur on a relatively frequent basis, allowing individuals the opportunity to win a few dollars here and there. The game may not pay out as much as some of the other games that are around, but is still provides an opportunity for people to have a good time. One thing that should be noted is that Lost Island is not available in all locations. As a result, there is a rather large component of the population that is not able to play the game, at least as of yet. This will likely change, as the games developers have a habit of turning out approximately one new game every month. Chances are, this game will be made available in a more widespread fashion if it catches on in the places that it is currently being played. 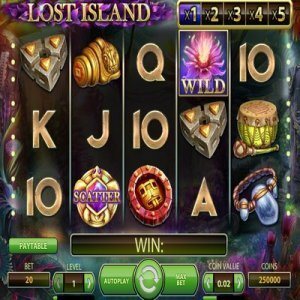 Lost Island is another variation on the multitude of video slot machine games that are available and while it may not be as widely available or as popular as some games, it does have some things about it that are different which makes it appealing. Only time will tell if this game becomes more widely available or offers larger payouts in the future.